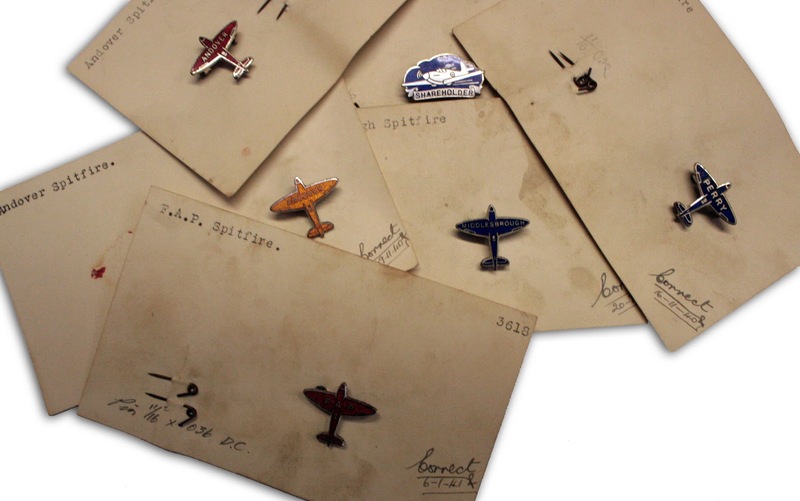 These small badges with Spitfire designs have been found at the “attic” of Toye Kenning & Spencer, a London-based company which produces insignia, medals, uniform accoutrements and badges. This venerable company has been internationally renowned for designing and manufacturing insignia for the British Crown, other heads of state and dignitaries. Their customer list also includes the British Armed Forces. Humble in comparison with the company’s flagship products, these Spitfire badges are old and intriguing – there is a series of enameled sample badges in different colours with a Spitfire silhouette and names: ANDOVER, MIDDLESBOROUGH, PERRY, F.A.P. (?). The samples are dated 1940-1941. Also, there is another metal badge with blue enamel background showing a Spitfire in flight and an inscription: SHAREHOLDER. No records have been preserved with regard to their purpose. After clearing out a lot of old information in the office we came across these Spitfire badges. They date back to the 1930’s and 1940’s and wondered if there was anybody out there that could provide us with some historical information? Please take a look and leave us a comment with any information you might have about the badges! The towns stated on the badges undoubtedly had Spitfire funds (donantions by the public etc) to sponsor the building of one for presentation to the RAF. They were often named after towns etc and there was publicity.